The time has come to discuss what happens to your old tire. The sad truth about old tires is that of vast majority of them end up in a landfill which ends up creating a huge rubber mountain. This mountain can quickly become a breeding ground for disease carrying mosquitoes and rats. Should lightning strike that tire mountain and ignites it this pile could end up burning for months and even years generating smelly black smoke and toxic fumes. Doesn’t it then make better sense to recycle your tires? Absolutely it does! So, exactly what happens when you recycle a tire? Almost half of all scrap tires end up being burned for their own energy. Each tire contains around 5 gallons of oil that is essentially burned out and used to fuel power plants. This is known as tire derived fuel or TDF. Most of the tire derived fuel goes into cement kilns for burning but they also fuel electric companies and paper factories. 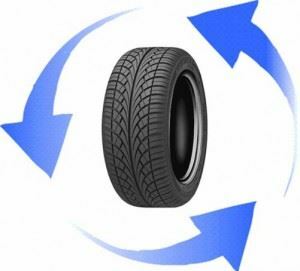 Before a tire can be burned for fuel it has to be shredded to extract the metal that is used in its own manufacturing process. It’s that tire shredding that also creates many other byproducts of recycled tires. When a tire is shredded what’s left over is referred to as crumb rubber. This rubber can be used to surface playgrounds which in turn provide a soft padding for tumbling kids. That same concept is applied to rubberized asphalt that goes into paving roads which helps reduce traffic noise. This material is also ideal for running tracks because it absorbs impact a lot better than typical asphalt which is a lot easier on the legs. And that crumb rubber can also be recycled back into synthetic rubber which ends up going right back into making new tires! If you get a flat and replace that tire you could find a way to recycle it on your own by turning it into a swing for the kids or a planter. While those are both practical reuses of a tire they’re not always appealing to look at. Your best bet is to hire professional junk haulers like Junk King San Antonio who know exactly where to take tires for recycling. The same pro junk haulers can also recycle other items you might want to get rid of. While it is true that your weekly garbage pickup can handle the recycling of most of your household throwaways, Junk King San Antonio can take care of the bigger items like an old sofa, mattress or even refrigerator. Then there is all that e-waste such as old computers, telephones and televisions. Much like tires that e-waste has to be disposed of properly in order to avoid releasing hazardous chemicals into the atmosphere. Junk King’s professional junk removal team will be able to handle all the heavy lifting of your tires or any other item you’re throwing away. They’ll also have a big enough truck for all your junk. That’s a lot better than putting in old tire in the back of your SUV! Get rid of your tires the right way; let the pros handle that! This entry was posted in Junk King San Antonio, Old Tire Recycling, San Antonio Junk Pickup, San Antonio Junk Recycling, San Antonio Junk Removal, San Antonio Trash Pickup and tagged Get Rid of Old Tires, Old Tire Recyling, San Antonio Junk Removal, San Antonio Tire Disposal, San Antonio Tire Recyling on December 30, 2011 by Mike Hasselbalch. Last updated August 2, 2017 .